Julia Turshen’s approach to a classic Friday night dinner has us wondering why we hadn’t done this all along. Though it comes around every Friday, Shabbat dinner still manages to feel celebratory thanks to the multi-dish spread, wine and fresh challah that often come with it. Of course, preparing all that food before sundown on a weeknight can sometimes be a struggle, which is why we were drawn to this one-pan approach from Julia Turshen’s cookbook Now & Again. 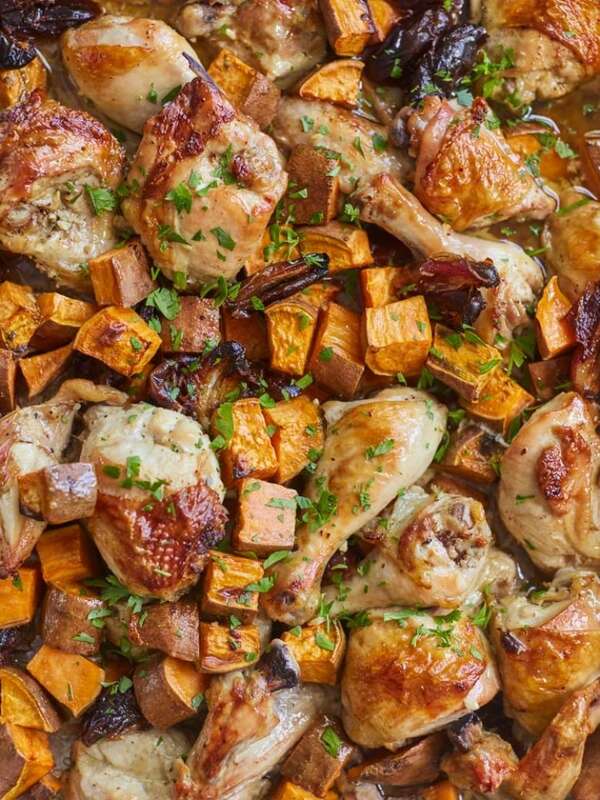 The chicken, sweet potatoes and dates cook all together for a flavourful feast that’s so much simpler than the alternative. Serve with a nice green salad, and your weekly meal is all taken care of! In a large roasting pan, whisk together the vinegar, olive oil, water, garlic, salt, and pepper (you want a pan that’s big enough to hold all of the chicken pieces in a single layer; a disposable aluminum pan is good for this if your roasting pan isn’t large enough). Add the chicken pieces, sweet potatoes, and dates. Use your hands to mix everything together and get the marinade on all of chicken, sweet potatoes, and dates. Warning: the following is a bit messy, but bear with me. Move everything around so the sweet potatoes and dates are in a single layer on the bottom of the pan and the chicken pieces, skin-side up, are in a single, even layer on top. Excerpted from Now & Again by Julia Turshen. Photography by David Loftus. Recipes Copyright © 2018. Excerpted by permission of Chronicle Books. All rights reserved. Pumpkin pancakes, poached pears and more — here's what to cook in October! What to cook in September: Butternut squash, kale — and grab beets before they're gone!